As most of the United States geared up for the Super Bowl, the people of Easter Island were preparing for their own machismo-fueled competition, a unifying cultural touchstone that would set the tone for the year to come and determine a champion. This year, the 14-time winner of this contest was coming out of retirement to take one last stab at the title. Had they known about this celebration, ESPN's analysts would have had a field day. The traditional men's triathlon, called the Tau'a Rapa Nui Pa'ari, is the premiere event of the Tapati Festival, a two-week cultural festival that celebrates the traditions of an island in the South Pacific about which much has been written and little is known. Hence the goals of Tapati, which was first held in 1975 and seeks to celebrate cultural activities as diverse as dancing, carving, singing, eel fishing and the aforementioned race, in which competitors paddle reed boats across a volcanic lagoon then circumambulate the lagoon carrying 55 pounds of bananas then make another unburdened lap and finish with a reed-float assisted swim back across the lagoon. It is run in the 80-degree heat at the height of the Southern Hemisphere's summer. On the banks of the crater lagoon, an atmosphere somewhere between country fair and big-game tailgating breaks out, with hundreds of spectators pouring into Rano Raraku, which is still dotted with unfinished moai, the monolithic statues that have come to symbolize Easter Island. Working local press interview competitors as assistants weigh banana bundles. Barbecue grills smoke as sausages cook. Beers and chilled fruit juice flow. A couple men set up a flimsy post-and-rope barrier that will later fail to keep the crowd away from competitors. As the crowd grows and the start time approaches, an announcer grabs a mic and starts droning into the PA. Worried that my Spanish is the problem, an Ecuadorian spectator next to me confirms that the address is as incomprehensible as Phil Simms' pre-game analysis. Still, we can see the rowers lining up across the lagoon, and, with little fanfare, the race is on. The paddle takes much less time than I expected and the muscular racers, wearing nothing more than jockstraps, pick up their banana bundles, resting a strap over their necks to literally help shoulder the burden. Only one of the eight competitors is too far behind to stay competitive. The crowd roars. The first lap creates some distance between the front half of the pack and the back, and the separation holds as the racers drop their bananas and sprint on to the final stage, a swim across the lagoon on a small reed float. In the heart of the pack is Tumaheke Durán Veri Veri, a racer who retired from the competition a few years ago after winning 14 years in a row. He's back, spectators tell me, because his niece has been crowned ceremonial queen of the Rapa Nui this year. His brother is also racing. But nobody seems concerned that Tumaheke isn't leading at this stage. 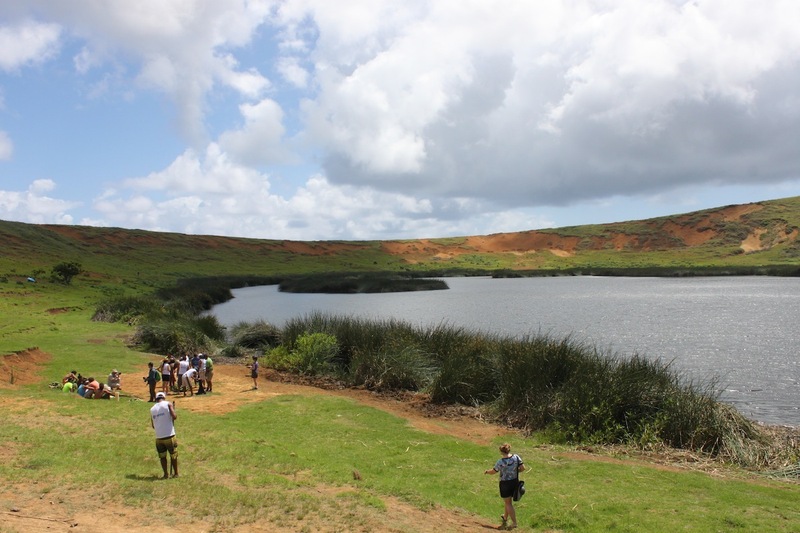 A park ranger at Rano Raraku, he's got the expertise to swim the lagoon with such speed that he can easily make up the distance to first place, one spectator says. With little practice in the lagoon, other swimmers, who generally train in the ocean, strain under the comparatively poor bouyency of the fresh water. As Tumaheke pulls his float out of the water, a whistle blows and the crowd explodes in approval. He's now a 15-time champion, bedecked with leis as he catches his breath. A media scrum forms around the champ, even as other racers still push themselves to the finish. As interviewers clamber forward and friends embrace the finishers, I'm too far away to hear if anyone promises to visit Orlando soon. But they live here, and if Tapati is any proof, there's no reason to leave. Even to celebrate a big win.